When fellow farmers tell me the dairy checkoff program should just focus on the United States and forget about exports, I ask them a question they can't seem to answer. Article author Marilyn Hershey and her husband Duane run an 800-cow dairy farm in Cochranville, Pennsylvania. Hershey is chair of USDEC's parent organization, Dairy Management Inc., which manages the national dairy checkoff program. Editor's note: This article first appeared on the Dairy Management Inc. blog. I embrace conversations like this. I jokingly tell people a little-known historical fact—dairy farmers invented skepticism. I informed him that for the first six months of 2018, U.S. dairy exports were equivalent to 16.8 percent of milk solids produced. By the way, that is our highest percentage ever for the first half of a year. I asked my neighbor what he thinks we should do with that American milk without global markets. Neither do I. But there is good news. An ambitious new checkoff-funded initiative called “The Next 5%” aims to increase exports five percent, from roughly 15 percent of production in 2017 to 20 percent of U.S. production by 2022. Why should dairy farmers embrace this goal? Look at the first chart below. 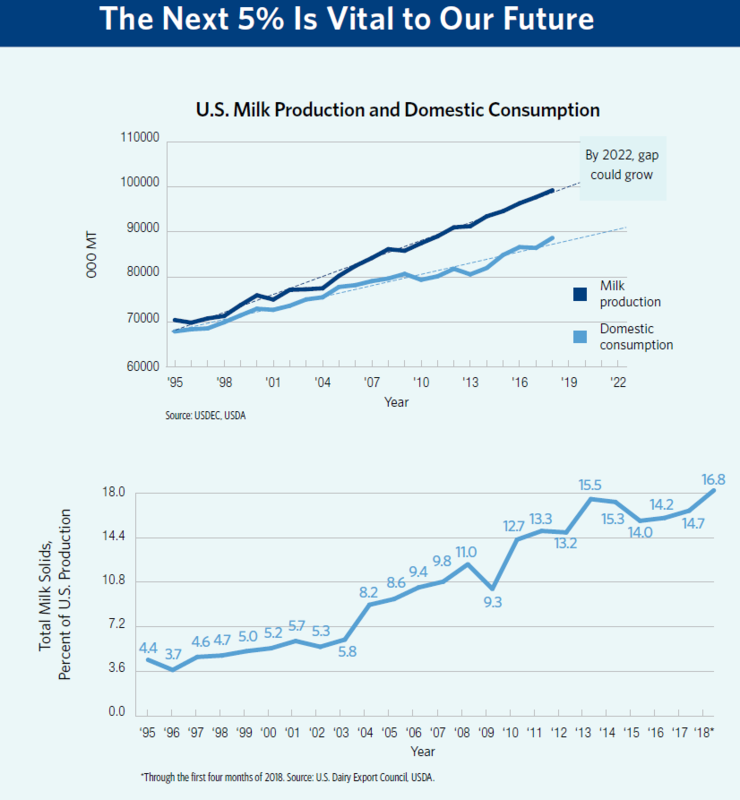 It shows how U.S. milk production is increasing at a faster rate than domestic milk consumption. In the coming years, the gap is expected to widen, a big problem for dairy farmers. The second chart shows how exports have increased since 1995 as a percentage of total U.S. milk production. Looking ahead, our exports must continue to trend up to help close that gap between domestic supply and demand. No wonder U.S. Dairy Export Council President and CEO Tom Vilsack, a former U.S. Agriculture Secretary, says ramping up exports is necessary to keep more dairy farmers in business. USDEC forecasts the world will need an additional 1.3 million metric tons of dairy products to meet global demand growth over the next three to five years. With extra funding from DMI and state and regional checkoff organizations, Vilsack and his staff project we can increase cheese exports by 200,000 tons and dairy ingredient exports by 450,000 tons during that period. Let’s hope he is right. Dairy farmers are hurting. Some see globalization as the problem. But with 95 percent of the world’s population living outside U.S. borders, we are looking at a growing opportunity. Checkoff puts "boots on the ground"
Checkoff funding of “The Next 5%” has enabled USDEC to put “more boots on the ground” in growth markets. Already this year, USDEC has hired business development directors, a key account manager, and an application scientist in China, Japan, South Korea, Southeast Asia and the Middle East/North Africa. USDEC also has formed partnerships with prestigious academic and culinary institutions in China and Singapore. These established relationships put us more in touch with market trends while demonstrating our commitment to global customers. The sooner we as farmers can embrace the fact that globalization is here to stay, the better off we will be. USDEC is our vehicle for farmers and suppliers to work toward a common goal of moving more milk out of this country into other areas of the world. If you have questions or comments about your checkoff-funded dairy exports program, feel free to reach out directly to me at talktomarilyn@dairy.org. Marilyn Hershey is a dairy farmer in Cochranville, Pennsylvania, and the chair of Dairy Management Inc., which manages the national dairy checkoff program.